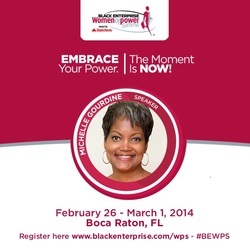 Dr. Michelle Gourdine told participants at the 2014 Black Enterprise Women of Power Summit that #Black Does Crack. African Americans are aging faster than we should, resulting in serious health conditions like diabetes, stroke, and obesity. But making healthy lifestyle choices can slow the aging process and even prevent disease! Dr. Gourdine will share healthy lifestyle strategies that fit into the overloaded schedules of busy professional women. The Black Enterprise Women of Power Summit is a professional leadership conference designed especially for executive women of color. This event convened at the Boca Raton Resort & Spa, February 26 - March 1, and brought together over 800 influential business women from across the country!